SmackDown senior official Nick Patrick is responsible for maintaining order inside the squared circle, but he’s certainly no stranger to controversy. In fact, Patrick was a major instigator of controversy when he was a referee in WCW. In 1996, the nWo was rapidly becoming the strongest group of professional wrestlers in WCW. They could seemingly do whatever they wanted, to whoever they wanted, whenever they wanted. But the referee would always have the final say in the official ruling of the match. How could the nWo overcome this obstacle? Recruit their own, personal referee of course. The nWo successful targeted Patrick as their personal referee, and no one could get in their way. Before long they even hosted their own pay-per-view event called Souled Out. It was on this night that Patrick had his busiest night as a referee. Since it was an nWo sanctioned event, Patrick refereed every match on the card. Needless to say, it was a very successful night for the guys in black and white. His rule-breaking antics also earned him his first-ever match as an in-ring competitor. Patrick faced Chris Jericho at World War 3. The stipulations of the match forced Jericho to have one arm tied behind his back, but it wasn’t enough to help give Patrick a victory. Eventually the nWo’s dastardly tactics got to Patrick, and after refusing to cheat anymore, he was kicked out of the group. Patrick wound up in WWE almost immediately after WCW was purchased by Mr. McMahon. 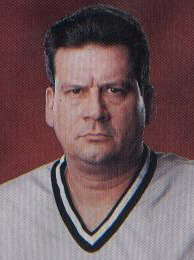 Patrick quickly became associated with The Alliance and became an instant rival of WWE’s senior official, Earl Hebner. The competitiveness between WWE and The Alliance became so heated, that even the referees of the two sides were at odds. In fact, Patrick and Hebner even faced off at the Invasion pay-per-view in July 2001. Even though Patrick, who is the son of the famous Masked Assassin, has wrestling in his blood, Hebner got the better of him. After his fellow WCW referees got involved, special guest referee Mick Foley sent them to the back. With no help by his side, Hebner speared Patrick for the win. Patrick now gets along with all of the other referees. In fact, he’s SmackDown’s senior official and oversees the entire referee crew. - WCW World War III '96 (November 24) = Patrick lost to Chris Jericho, who had one arm tied behind his back. - WWF Invasion (July 22, '01) = Patrick(Alliance) was beaten by Earl Hebner(WWF). Mick Foley was the special referee.